I LOVE curry! I am passionate about a lot of different types of food but curry really is one thing that I just cannot get enough of. So when we were in Sri Lanka a few weeks ago I was intent on eating as much curry as possible, starting with having a traditional Sri Lankan breakfast every day. Most days that involved hoppers - a sort of bowl-shaped pancake made from rice flour and coconut milk - filled with dhal and sambol. The dhal was wonderful - light and packed with flavour but without being too spicy. The chef in our villa didn't know all the English names for the spices so when I asked him about the ingredients he brought all the tubs of spice from the kitchen so that I could work out what they were. From those conversations, and a bit of experimentation, I have pieced together this recipe. This is my interpretation of the dhal that I had in Sri Lanka but it is by no means confined to breakfast. We have been eating it for dinner with some simple flatbreads, you can find the recipe for the flatbreads here. Heat the coconut oil in a large pan. Fry the onions for 5 minutes until starting to soften and then add the garlic. Fry for 2 more minutes and then add the spices and salt. Continue to fry for a couple of minutes until the spices start to release their aroma and the seeds start to sizzle and pop. Add the lentils, stir well, and then add the stock. Simmer for 20 minutes until the lentils are almost cooked. If it becomes too dry add a little more stock as it is cooking. Add the coconut milk and continue to simmer for 10 more minutes until the lentils are soft. Serve with hoppers, rice, roti, or other flatbreads. 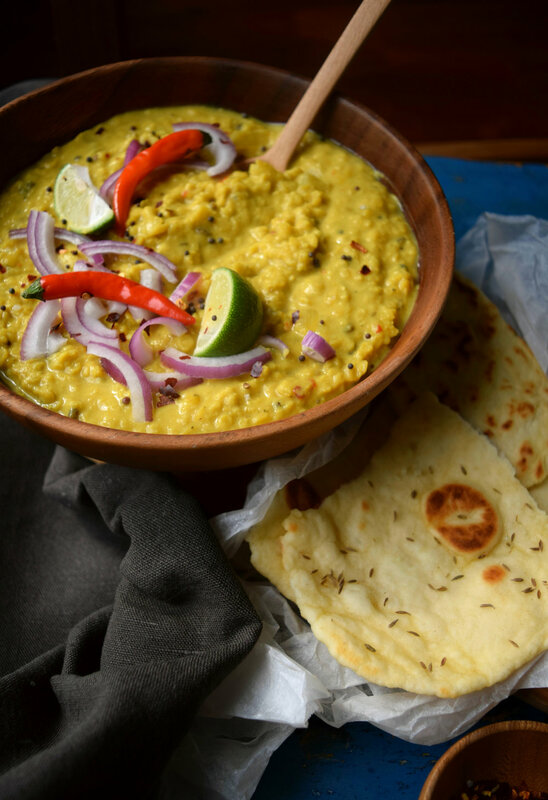 Sri Lankan dhal and flatbreads.